When you decided to lose weight and lead a healthier lifestyle, you didn't envision living with loose, uncomfortable skin on your body and face. Cosmetic surgery can help you achieve the body shape you've always wanted. Dr. Thomas McNemar is a board-certified plastic surgeon who performs plastic surgery after weight loss for San Francisco and Central Valley residents just like you. Take the first step and get in touch today. Even if you don't live in Northern California, Dr. McNemar believes you should still have access to high-quality plastic surgery options after weight loss. He has established a "Fly In Surgery" program for out-of-town patients who want to achieve for themselves the results they have seen Dr. McNemar provide for others. 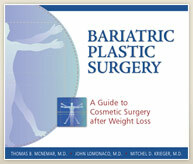 Click here to view before and after photos and get a better sense of what's possible for you. When you choose post weight loss plastic surgery from Dr. Thomas McNemar, you are joining a family of men and women whose lives are improved and whose stories are inspiring. It all starts with your first visit. That first step can be the biggest one - we take out the uncertainty and guesswork by explaining just what you can expect. No matter what, you will feel welcomed and receive an evaluation of your unique needs. You have options to improve your look and increase your comfort from head to toe. Learn more about how Dr. McNemar performs the procedures that can make a huge difference in your quality of life.